Roasting a whole chicken shouldn’t be intimidating, but too many people psych themselves out before they even start. Cooking a whole chicken isn’t scary and is great for a dinner party. Once the chicken is in the oven you’ll have time to do last minute party prep. Whole chickens are very economical (sometimes a 1/4 cost of cut pieces and you can make a fantastic broth from the bones and clinging bits of meat), it looks impressive and has more flavor than boneless chicken. 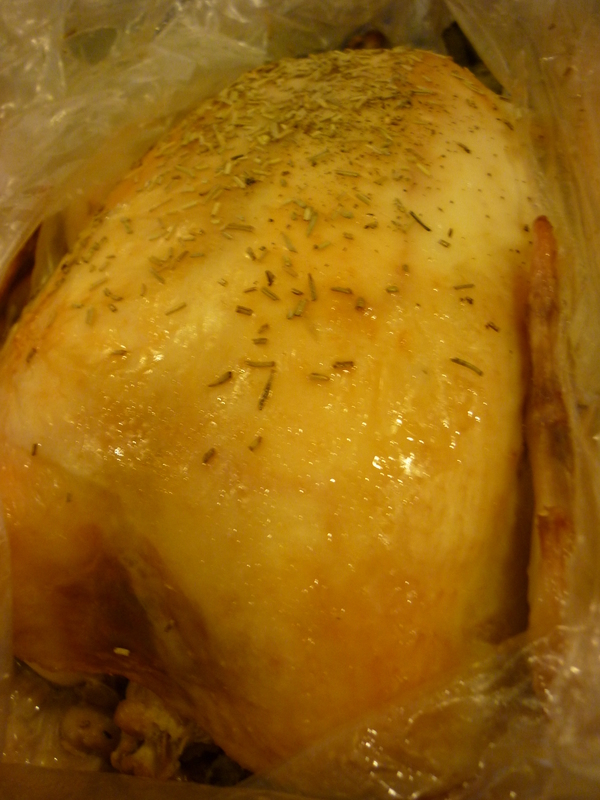 My recipe uses an oven bag so clean up is a breeze, there is no added fat and it still gets a nicely brown skin. A baking dish that has at least 2″ sides. Wash chicken inside and out. Remove any giblets, place on paper towel lined plate and pat dry. Stuff half of the onion and all of the celery leaves inside the cavity. Rub the salt and pepper all over the chicken. Place flour and onion powder in oven bag. Close bag and shake to coat. Set bag in baking dish. Place half of the onion and all the carrots in the oven bag. Set chicken on top of the carrots and onions. Close bag with included tie, cut 6 half inch slits on top of bag. Bake for 30 minutes, turn oven down to 350 degrees. Continue baking for 70 minutes or until chicken is cooked to a minimum of 165 degrees. Let rest for 10 minutes. Remove from bag and serve. 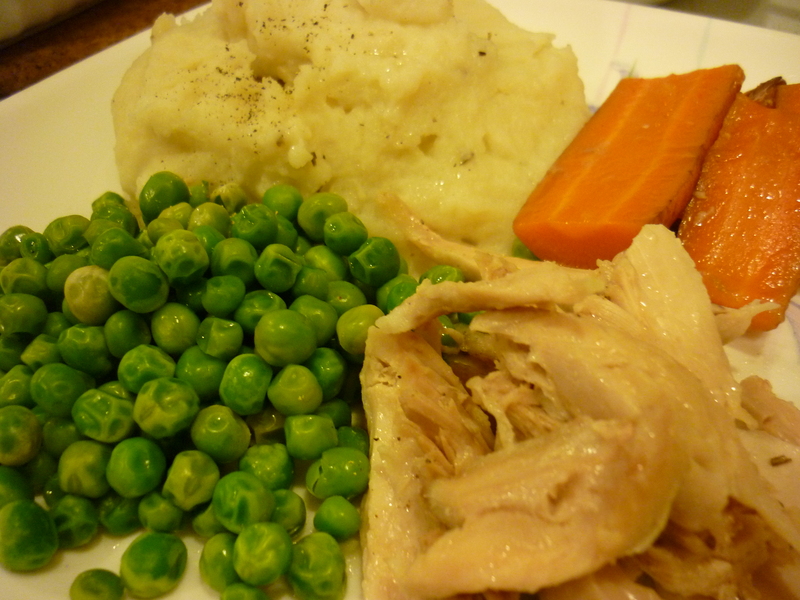 The leftover chicken carcass with bits of meat attached, skin, carrots and onion. 4 whole peppercorns or use ground black pepper. Using a colander strain meat, skin & bones from broth into a glass bowl. Refrigerate until fat is solid, remove fat. Freeze broth in desired portions. To use: dilute with water to desired strength. Great to use as a base for homemade soups, cooking rice or anytime a recipe calls for broth. Pingback: Hungry? You will be.